Home › Toys › Bits And Pieces - 750 Piece Shaped Puzzle - The Watchers Owl - By Artist Jack.. 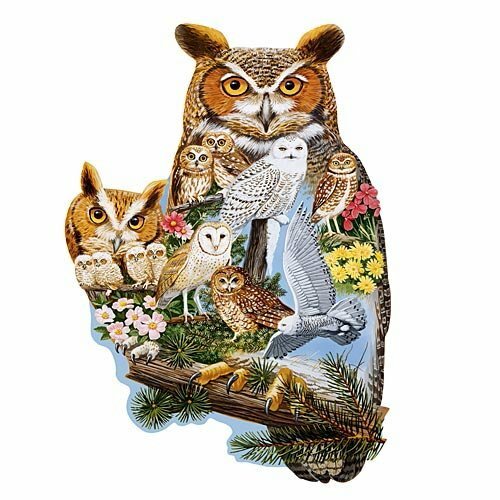 Bits And Pieces - 750 Piece Shaped Puzzle - The Watchers Owl - By Artist Jack.. Contains a 750 piece shaped jigsaw puzzle designed by artist Jack Williams. Bits And Pieces shaped jigsaws are designed with unique die outlines and no straight edges for a truly challenging puzzle experience. Shaped Puzzle Size is 20" x 27" when completed. The Watchers is a 750 Piece Shaped Puzzle Designed by artist Jack Williams.This puzzle, shaped like an owl, depicts these wise birds perched amongflowers. This puzzle is 20" x 27" when completed. Since the 16th century,jigsaw puzzles have been a favorite pastime for all ages. Now, withtechnological advances, Bits And Pieces has taken jigsaw puzzles to a newlevel of superior quality and challenging fun. Every original Bits And Piecesjigsaw puzzle is made with ultra-heavy weight board and cut with qualityrandom puzzle dies with fully interlocking pieces for a secure fit. At BitsAnd pieces, we believe that every truly exceptional jigsaw puzzle starts withthe work of a truly exceptional artist. We understand what it takes to make agreat puzzle. The kind that challenges rather than frustrates, where each areahas depth and detail that unfold into a larger beauty. Bits and Piecescommissions original artwork by artists from around the world to createimaginative artwork that puzzlers like you are looking for in a wide varietyof puzzle sizes and styles for any age or ability. We know every puzzler isdifferent, so every Bits And Pieces original puzzle is manufactured in twodifferent piece counts, ranging from 100 pieces to 2000 pieces. We also havean innovative collection of specialty puzzles including glow-in-the-darkpuzzles, glitter effects puzzles, unique shaped puzzles and puzzles withoversized pieces. This 750 Piece Shaped Puzzle was created by the artist JackWilliams.